Football’s back, which means so is the Giants Week in Review Series! About half way through the game, I tweeted the following message: “Am I watching #LittleGiants?” No, Eli and Kevin Boothe didn’t successfully execute the Annexation of Puerto Rico for a game clinching score. The “Ice Box” didn’t blast a Cowboys running back into a table full of Gatorade either. And, unfortunately, Ed O’Neal wasn’t on the sidelines wearing short shorts. The Giants simply played like a pee wee team throughout most of the first half, and in key moments in the second half. They turned the ball over six times in the 36-31 loss. Six! Anyway, let’s just sum this one up quickly and go about our day in peace. We might never see David Wilson again. Last year, on opening day, Wilson fumbled on his second touch of the game and practically disappeared for the next three months. It doesn’t take much to get in Tom Coughlin’s doghouse when you’re a young player. On opening day in his second year, Wilson again fumbled early… and late. That’s right, two fumbles. After the second one, Wilson didn’t play the rest of the game. Instead, Da’Rel Scott ended up with all the carries. In Week 2, I think we might end up seeing someone who isn’t even on the current roster getting the bulk of the carries. I vote for Willis McGehe or Beanie Wells (yep, it’s come to that). To be safe, I picked up Scott in my fantasy league, but I don’t expect much from him either. Eli Manning actually had a decent game if you’re looking at statistics. He threw interceptions on two of his first three possessions, including the very first pass of the game, but he ended up with 450 yards and 4 TDs. After the rough start, he really got it going, throwing three TDs to Victor Cruz and hitting three different receivers for 100+ yards (Cruz, Hakeem Nicks and Rueben Randle). The other TD went to newly acquired Tight End Brandon Myers. Without the turnovers, the Giants would have absolutely run away with this game, especially the last one. That’s right, the sixth turnover of the game was the one that sealed the loss. Eli had the ball with less than two minutes to go, down by only six points. He tried to check down to Scott on a short pass. Scott turned just too late, stuck his hand up and deflected the ball right to Cowboys defender Brandon Carr, who took it to the house to basically seal the win. 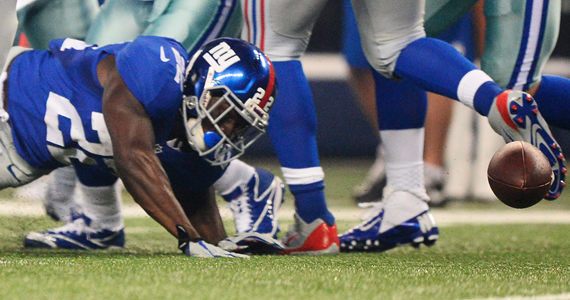 The Giants would score and attempt an on-sides kick with about ten seconds to go, but the ‘Boys recovered… tough. Although the offense often put them in bad field position with turnovers (even one on a botched punt return! ), the defense didn’t exactly shut the Cowboys down. 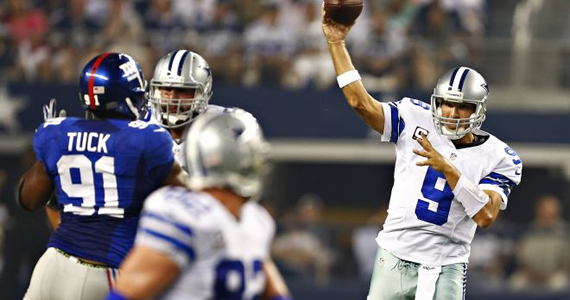 Romo completed 36 of his 49 pass attempts for 263 yards and 2 TDs, and DeMarco Murray picked up 86 yards on the ground. Both of the TDs were to Jason Witten, who is off to another hot start. Romo’s high completion percentage was indicative of the fact that the Giants secondary was having trouble covering anyone. They used a whole lot of zone coverage schemes (a Perry Fewell specialty), and refused to use man coverage, even after the zone was clearly not working. Despite a couple of key late stops, a solid game by Justin Tuck and a couple of big hits on Tony Romo, the defensive line had a lot of trouble getting to the Quarterback all game long. The Giants defense only works well when they’re pressuring, hurrying and otherwise abusing opposing QBs. If they don’t do that, it’s going to be a long day for this depleted secondary. Speaking of depleted secondary, the Giants lost Prince Amukamara to a concussion in this game; A concussion he suffered when he slammed head first into Ryan Mundy (whom the NBC announcers kept calling Monday all game). Mundy, for those of you who didn’t read my Giants preview, is one of the Giants’ starting safeties. That play pretty much summed up this whole game for the Giants, who spent the day being their own worst enemy. 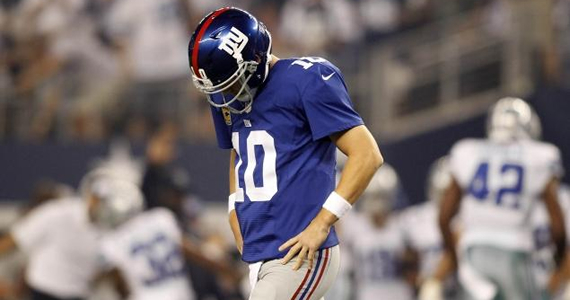 This was the first loss the Giants have suffered in Dallas since 2008. I guess they couldn’t keep that streak going forever. 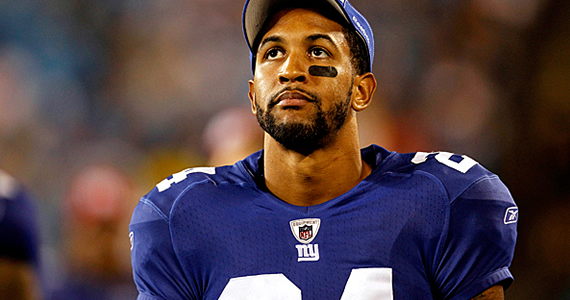 Rueben Randle showed that he might be a legitimate third option for Eli when Cruz and Nicks are covered. He looked great. Dez White, of the Cowboys, had his ankle rolled on late in the game. Hope he’s OK, for Dallas fans’ sake. Terrell Thomas, the guy trying to come back from two torn ACLs, played well in his first start in two years. Good story. Shaun Rogers is one of the biggest men I’ve ever seen. Mundy had a big interception early, returning it 91 yards to the two. The Giants had to settle for a Field Goal. Annoying. Next week, at 4:30PM, the Giants will play the Denver Broncos. That’s right, folks. MANNING VS. 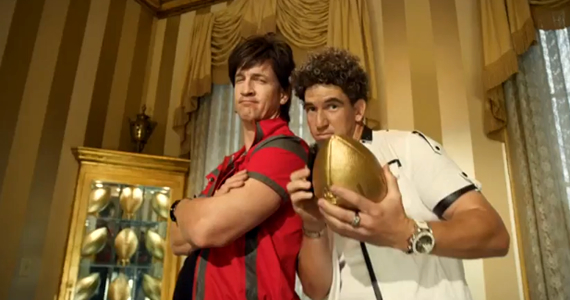 MANNING!!! It will be the third face-off between the guys from the Football on Your Phone commercial. The first two have been won by Big Brother Peyton, who is coming off a record-setting Week one performance (462 yards, 7 TDs). If Eli, and the rest of the Giants, can keep from turning the ball over, they might have a chance. At some point, little brother has to get a win, right? We’ll be back to discuss that in one week’s time. Let’s try to move on from this bad loss. The Giants need to play better. 0-2 does not look good on anyone.